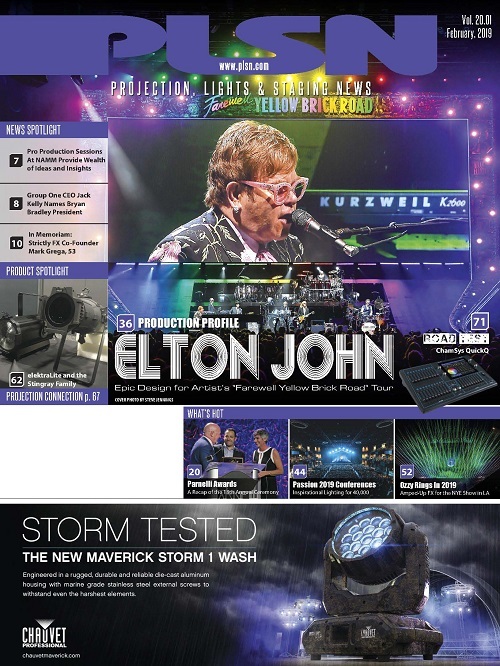 For many decades, the use of dry ice/CO2 foggers to create that low-lying look of cloud tops and complete stage magic has transcended the audience experience. Low-lying fog can transport the presence onstage to magical locales, dream scenes and mysterious reveals across a very wide genre of entertainment — from theatrical production, to concerts, corporate events and the film/television/broadcast world. The number of effects out there today that rival the look and feel of a well-done low-lying fog moment are few. Just like anything else in our world — a table saw, a pick-up truck, a high-intensity automated fixture — when used properly, dry ice effects are safe, effective technological alchemy. Also, as outstanding as the dry ice/carbon dioxide effects are whenever used, deploying them has special challenges, from industry safety regulations to carbon dioxide supply-side issues, as the world has experienced during the summer of 2018. 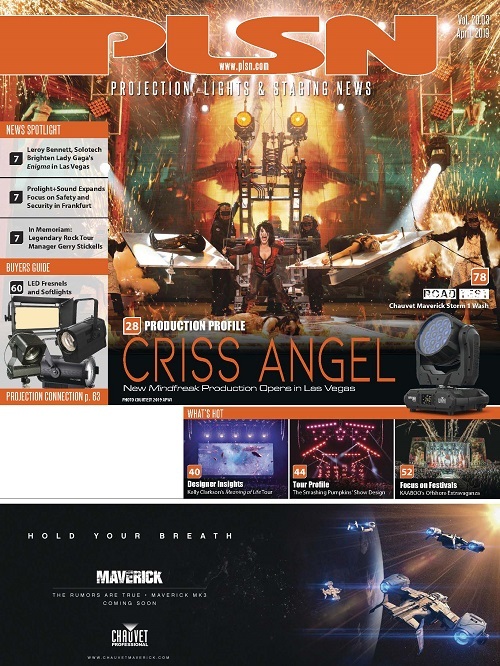 Chauvet’s engineering team has created a new atmospheric offering to combat some of the issues our industry has with the use of dry ice/carbon dioxide fog. Meet Cloud 9 — a low smoke generator using no CO2, no dry ice, no special coolants or compressors and requiring no special training or certifications to produce up to two hours of effective, continuous low-level fog using just fog fluid and water. Historically, this effect was achieved by taking a large capacity metal drum or large metal trash can, a length of dryer ducting hose, some type of electric heater element and some simple engineering prowess. Water is added to the drum or trash can and heated; dry ice is added to the mix at just the right moment, creating a high-density, low-to-the-floor cloud that has given rise to more exciting Dream Ballet moments (to reference that famous scene in the classic Broadway musical, Oklahoma!, than almost any other atmospheric effect we use in Entertainment. Low-lying fog looks have revealed everything from performers to nuclear missiles, vehicles of all shapes and sizes and created magical environments for equally as many productions — events, movies, television, trade shows, concerts and corporate entertainment alike. 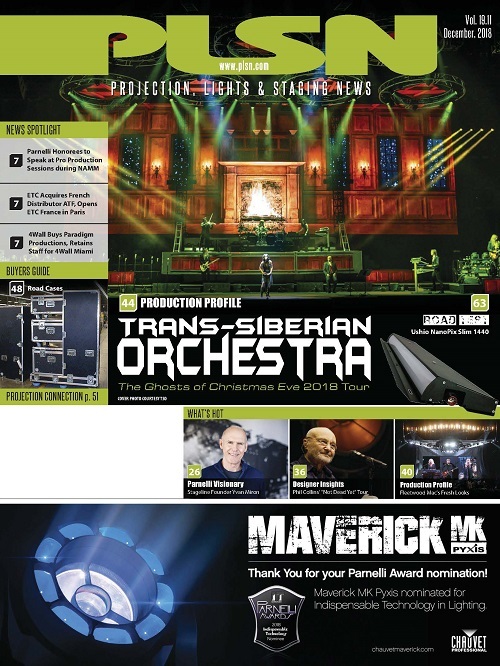 As the technology of LSG devices has improved over many decades, so have the regulations for how they are used onstage and onsite. Given that the effect utilizes either carbon dioxide or dry ice, which is frozen carbon dioxide (a suffocation and skin burn hazard if not used properly) and a heating element of varying types, special training and certification has come into necessity in order to utilize this effect safely. But, like all things technically driven, the correct procedures and safety mechanisms put in place often result in outstanding, game changing effects. 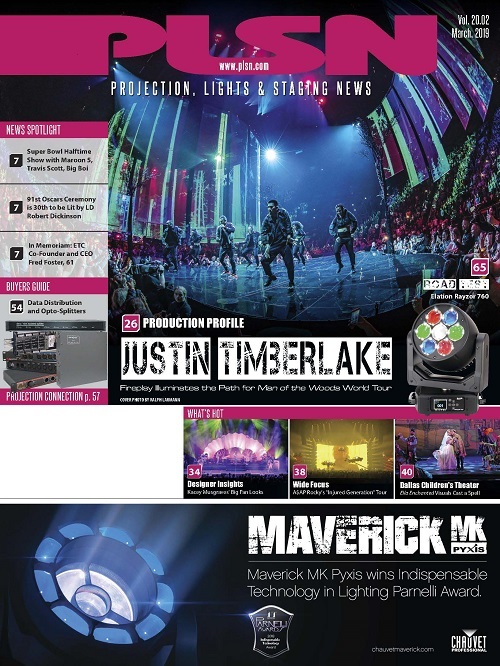 The DJ products division of lighting and effects manufacturer Chauvet has one of the world’s most popular dry-ice fog products, aptly named the Nimbus, that is used in thousands of events across the globe — as you read this, there is a Nimbus somewhere in the world cranking out a well-placed, well timed low-lying fog effect. When used properly, dry ice fog machines create some of the most mystical looks that can be created for an audience. There is also a very real risk of misused dry ice fog in large concentrations without adequate ventilation causing adverse health effects, and this can literally be fatal if given the right circumstances for the right amount of time. 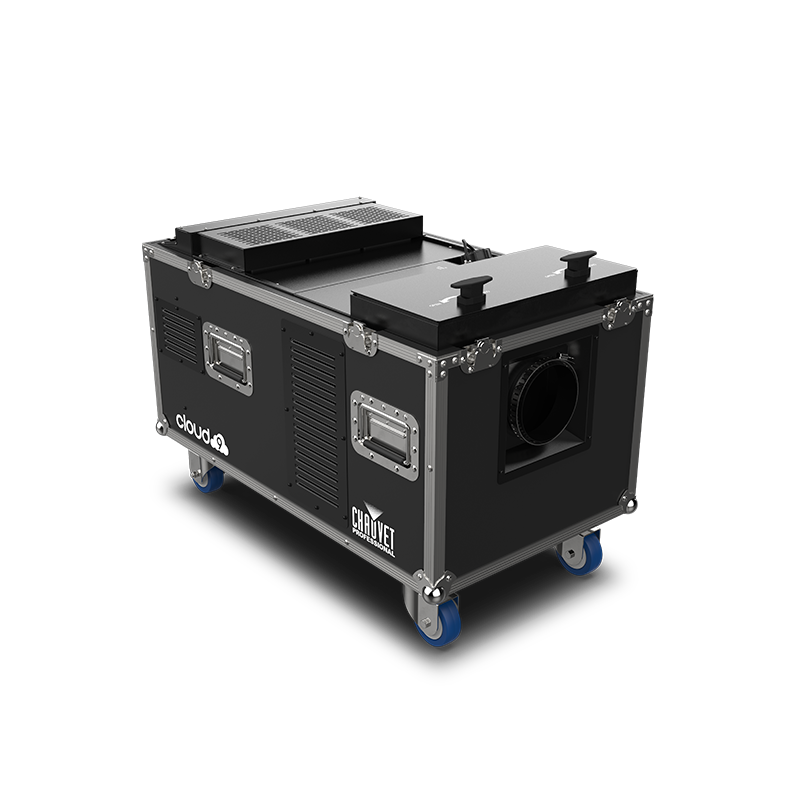 Other effects companies have added additional hoses and CO2 tanks that mix with their regular smoke machines to make the low smoke generator effect. These indeed work, but the problem is, the user must source large CO2 tanks for every event, costing the event or promoter additional funds to rent and have them delivered to the venue. In addition to the advancement of technology of dry ice fog, our understanding of the risks this effect can have also evolved. Cloud 9’s unique ultrasonic technology eliminates the dry ice component, allowing you to utilize a very similar effect without the need for special materials handling or training. Dry ice exists at -112 degrees Fahrenheit (-80° Celsius) and can cause severe second to third degree burns if brought in contact with skin in solid form. The reality of our industry is that dry ice effects are very effective and have a look and experience completely unique to the effect, but are regulated in many situations and require certification and training. 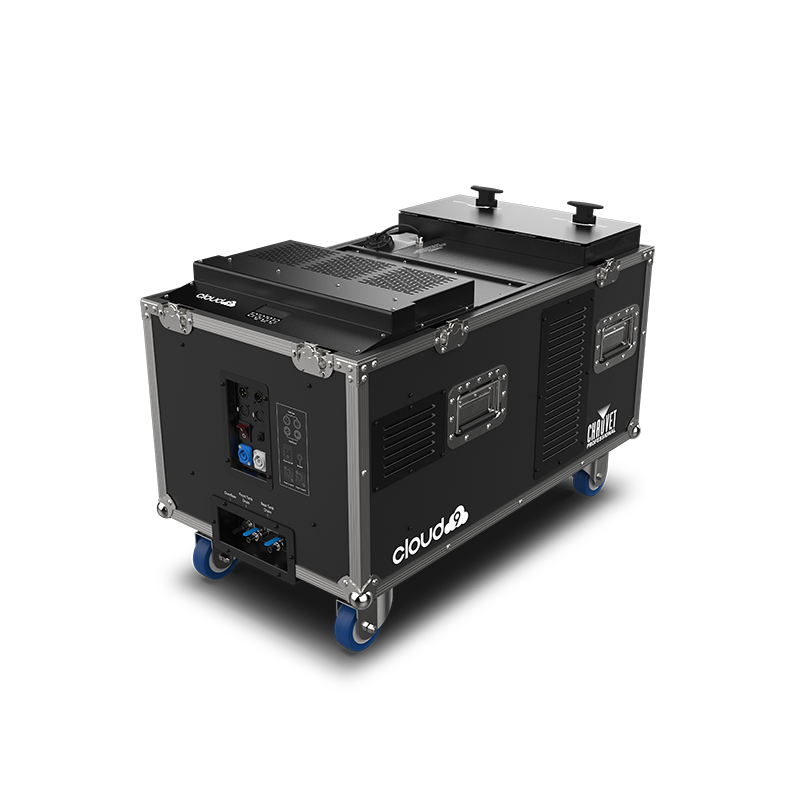 Cloud 9 has been created to replace the use of dry ice or carbon dioxide in situations or venues where you need the effect in your design but situational issues disallow its use. 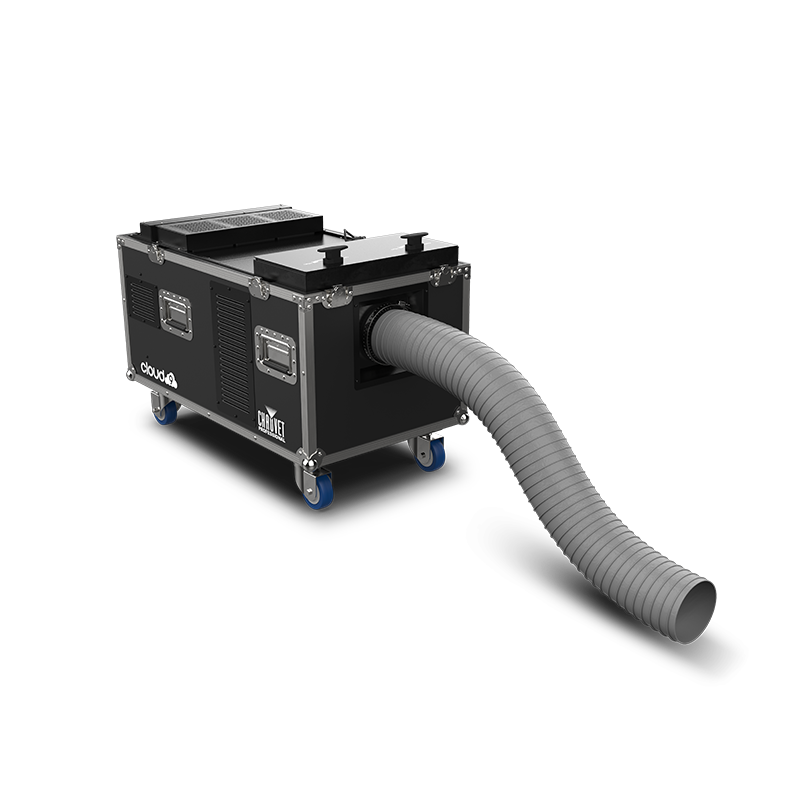 This impressive low-lying fogger gives a 15,000-cfm output for high impact, low-lying fog effects ideal for large-scale concert stages, theatrical stages, theme parks and large size events. That incredible output allows you to cover a 300-square meter area (3,230 square feet) with an equally low-hanging, high density fog that stays low and creates an effective display without the use of dry ice, carbon dioxide, or anything needing special permission, training, or certification. The Cloud 9 has a best-in-class heat-up time of four minutes and works with fog fluid, haze fluid or quick-dissipating fluid to produce that time-tested low-fog look. Cloud 9 works without a special coolant or compressor; only water and fog fluid is needed for continuous output up to two hours. 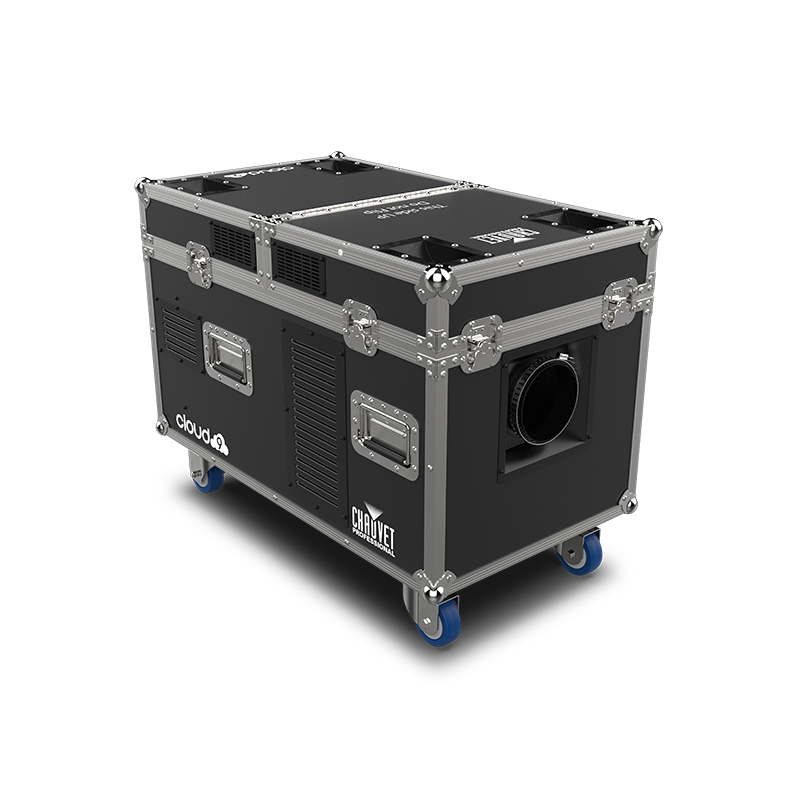 Adding further to its versatility, the unit has several handy transport features to help it glide easily across any stage — Cloud 9 is only 121 pounds (55kg) and on wheels and comes built into a custom flight case with a hinged lid, allowing you to use this unique system with the lid open or sealed. 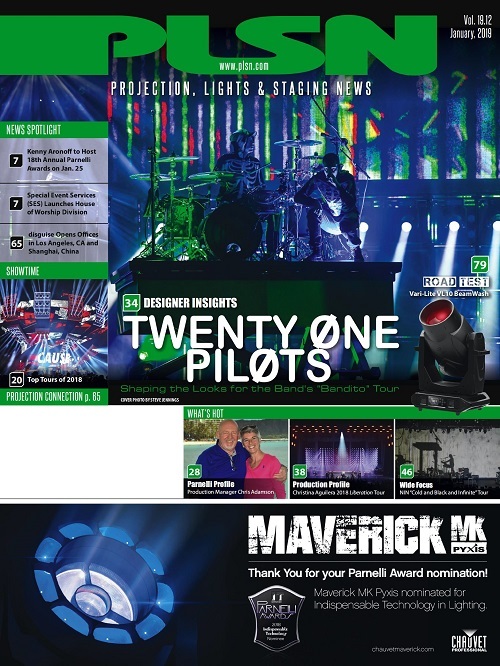 Chauvet Professional’s Cloud 9 has a 15,000-cfm output rating, providing ample quantities of fog without requiring dry ice or carbon dioxide for concerts, theater, theme parks and large staged events. Only water and fog fluid are needed for a continuous two hours of output. No special coolants or compressors are required. Ultrasonic agitator combines distilled water with fog to produce a low-lying fog effect. Flight case with locking casters with hinged top cover to allow for operation even when closed. Control via on board digital display or DMX. Integrated water drain system makes cleanup fast and easy. Works with fog fluid, haze fluid, or quick-dissipating fluid. Used without dry ice or CO2, so no special licensing/training required.